Seize the Initiative Right from the Start! Are you bored with slow maneuvering in systems such as the the Italian game with d2-d3 and the anti-Berlin? 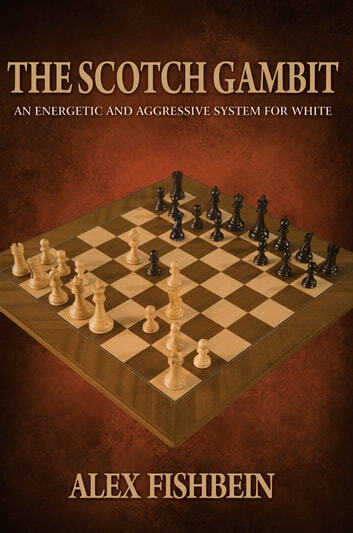 Do you enjoy confrontation in the center and sharp, tactical play? Alex Fishbein shows how the Scotch Gambit can give you exciting yet sound positions where you aim at the enemy king. In the Scotch Gambit, White immediately strikes in the center and attacks the f7-pawn, provoking concessions from Black. An imbalance typically results, where White has attacking chances on the kingside. The Scotch Gambit will help you develop a finer feeling for the initiative and improve your combinational vision. 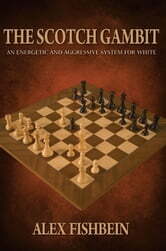 You will also better understand strategic concepts, such as weak squares of one color and pawn structure nuances. Fishbein, an experienced player and author, takes you into a modern grandmaster’s research lab. Here, all ideas are scrutinized and prepared for use against an opponent who is similarly armed with the latest theory and technology. The most critical responses for Black receive special emphasis. Alex Fishbein is an American grandmaster. His peak world ranking was #150. He was competitive in each of his four U.S. Championship appearances, including in 2004 when he won the Bent Larsen prize for the most uncompromising chess. A lifelong 1.e4 player, Fishbein is known for interesting and creative play. The Sniper: Play 1…g6, …Bg7 and …c5!